Weather in taupo currently is just amazingÂ and it might be a good few days to be heading out in the boat to jig, troll, harl or just relax and soak up a few rays before the next bad spell comes through. Cold evenings and clear nights will nearly always produce a fairly decent morning and we should be making the most of it. I couldn’t think of a better place to be right now as the lakeÂ is fishing ok and the rivers are full of trout.Â This information I tell you is a real report with truthful newsÂ as thereÂ is no benefit in it for me to tell you things are great when they simply are not. Most fisherman on the Tongariro are having some very good days and it seems a few new pieces of water which has opened up from the last flood have now scoured out enough and are holding big numbers of trout when pushing up from the delta. Anglers are excited about the fishery and especially this river over the past week or so which is very good to hear. I was again lucky enough to be on the water yesterday with some clients from Napier who fancied a half day guide so we ended up close to Taupo on the Hine. The Hine has been high for quite some time now and still has quite a bit colour as they continue to spill the top dams giving fisherman an extra advantage over the fish . This river continues to produce fish for most people and yesterday was no different with over 6 fish coming to the net in 3 hours. There is a very mixed bag of kelts, cloured up and fresh fish in the system now and this will be typical of the coming weeks leading into summer. Our morning was spent around the water supply targeting three or four pools which hold numerous trout most days but does receive quite alot of pressure, we seemed to have the best water to ourselves till about 10am. We kept one lovely solid silver fish which was dropped into Jolly Good Fellows to prepare for lunch before they headed home, all in all happy clients and a successful morning. This will be a busy week for me as I go through all my backcountry rods and gear which I will need as of 1st of October when the majority of water opens up again. IÂ love the thought of the end of yet another winter season in taupo and the start of something slightly different for the next few months in which will see me scattered all over the place in different catchments and watersheds. 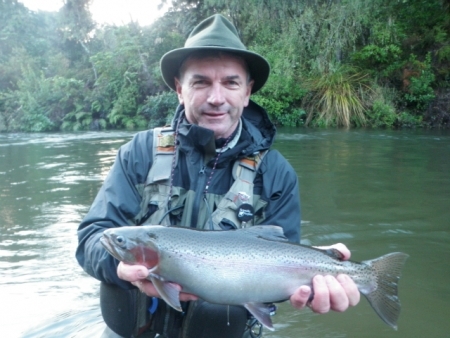 I have again be lucky with faithful clients and so far have the first four days of opening season booked by Phil NormanÂ where we intend to cover somewhere different every day starting in Taupo each morning. Being so central it’s nice to just see what the day brings and make a decision based on weather or wind direction the night before, most fisheries can be accessed within an hour or two of driving. Another piece of water which I intend to give some attention to this season will be Lake O. I have always liked this fishery and given many days per year in finding the weed beds and holes which fish hang out in but I must admit it still gives me the odd day where I just cant buy a trout anywhere !! I love the unknown factorÂ that this lake causes me and many others but also the sport it gives and the tremendous trout that can be captured there. I have not fished opening day here but I will assume it is a very busy place to be with most anglers wanting the best chance of hooking a trophy fish which has not seen or heard an angler for quite some months. There will no doubt be some good pics and stories which will emerge from an opening day here, lets hope the weatherÂ is good and the angling pressure is friendly. In my opinion catch and release is importantÂ here and vital on some of our other backcountry waters if we wantÂ to continue to be successful on most outings. 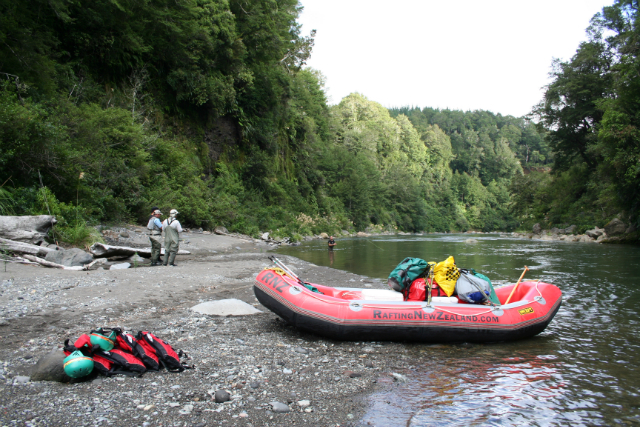 Summer fishing in New Zealand gives up so many options and I will be dealing with clients which want to access backcountry blocks via helicopter, rafts , quad bikes and good old leg power. I enjoy getting back at the end of the day and falling asleep with a beer in my hand which has only had the neck drank from it as I know I have covered some miles and tested my body. The only bit that makes me sleep better is knowing that my client has enjoyed his day and landed a few fish while learning some new skills or techniques. If any of you are thinking of exploring somewhere new this season and want to see or learn some more about waters let me know and we can surely sort out a brilliant plan. If you do have a busy itinerary with fishing over the next month or so and you are changing rivers or lakesÂ please be sure to help us stop the spread of invasive weeds and pestÂ species and wash all your equipment! 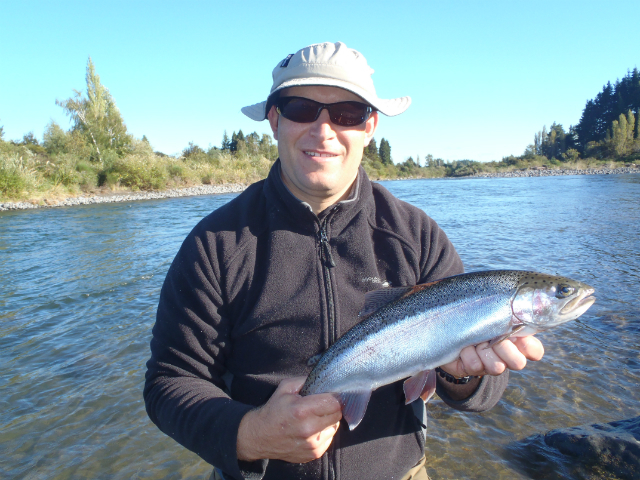 I am still needing to fill the diary for December when we will be concentrating on the upper Tongariro when it opens for fishing on the 1st of December. Raft fishing is the best and only access to see many of the spots in this area and I can report there are thousands of fish in this area. Every weekÂ I have spoken with the raft operators which pass over this water daily and they are seeing sometimes up to 100 fish in a pool. Last year was very bad up here and we struggled some days to keep anglers hooked up every hour but this season promises much much more which is great for fisherman and better for the river as it looks to be a bumper spawning season. These fish wont all be perfect but will be a mixed bag with kelts, fresh fish, recovered fish and the odd brown so it really sets itself up for some exciting angling. Nymphing is the preferred method and fish can be caught from the deep slow running holes but also the fast riffles which are great for recovering fish as it gives off good amounts of oxygen and plenty of food which has been dislodged. 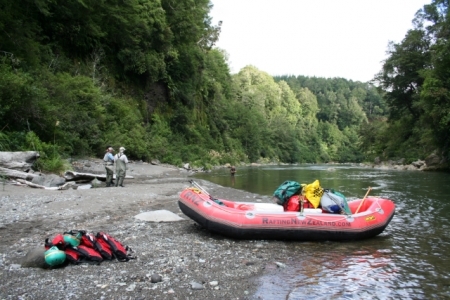 All in all a very good experience not only from the fishing point of view which is the focus but a day out rafting as well which sometimes the wife or partner enjoys just as much! !